Dave Cahill wrote: Interesting that Scarlets have benched DTH vdM after having an absolute nightmare against Adam Byrne back in march. Sanjay and Stefvans (gents outfitters) will provide a considerably stiffer challenge. Evans giving up a good 5 inches to Byrne and over three stone though, hopefully he gets a good run at him. I'd be worried about Isa and the other scummer though. Isa's form is poor. Luckily Scarlets don't exactly have distributors in the centre. Leo was saying in the presser thats Dev has been carrying a knock since Ulster and didnt train last week. 11 changes in total from that match for them, only McNichol is retained in the back line, and only four of the pack - Elias, Beirne, Shingler and Cubby Davies. wixfjord wrote: Evans giving up a good 5 inches to Byrne and over three stone though, hopefully he gets a good run at him. Leinster picked a poor time for one of their lousiest performances of the season in the last regular game of the season away to Ulster. Ulster played on emotion to give their departing heroes Roger Wilson and Ruan Pienaar a deserved send-off but an almost full strength Leinster team should have been able to overcome that. They destroyed Ulster's lineout and (eventually) their scrum too but there was no intensity to their play, generating a lot of poor ball which the backs found new and interesting ways to knock on or throw into touch. The attitude of the team was wrong from the start and Ulster deserved their win, not least for their brave defensive effort. R-Dog wrote: Leo was saying in the presser thats Dev has been carrying a knock since Ulster and didnt train last week. Good selection across the board. Only doubt for me is ISA's pace or lack of. We should win in a canter. If we get through, and that’s a big if, I’m very interested to see what we’ll do with Toner and SOB for a final against Munster. Surely both would come back into starting lineup, but hard to leave out the guys ahead if they play well. A possible conundrum. He said Dev picked up a knock during the Ulster game and didn't train last week. Reading between the lines though, he's been dropped because of form issues, which is hard to argue with, if harsh. Definitely needs a long off-season. Very exciting team selection generally, 6-2 split makes sense and starting SOB would probably be premature. O'Loughlin unlucky to miss out to Kirchner on the bench but I guess the latter is more versatile, a key consideration when you only have two backs on the bench. 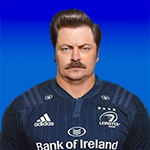 By my tally that's something north of 850 Leinster caps on the bench. That would represent a fairly experienced team never mind a Substitutes Bench. This selection looks like it is once again based on the relative performances within our Squad with those looking hungriest getting the nod over others. May be tough on RO'L in particular but happy to have all those back-row forwards involved and wouldn't be worried if Leavy had to do a spell at 12 or 13. Difficult to see how Scarlets will be able to cope with either the starting pack or the one that'll finish the game. Having said that, they have a very potent backline that could hurt us in the same way Cardiff did if the defence isn't up to scratch. If the defence is right and the pack are in a mean mood we'll win this, possibly comfortably. Hope it stays dry. Could be a cracking game if it does. Good to see Rhys getting some media plaudits. Has been excellent in recent weeks. neiliog93 wrote: He said Dev picked up a knock during Reading between the lines though, he's been dropped because of form issues, which is hard to argue with, if harsh. Definitely needs a long off-season. It's a tough game but competition for places is what's all about. Hopefully Dev will step up and have a huge year next year. Moloney, Ryan and others will be snapping at his heals and basically looking for his job! Nervous now, would be a huge letdown if they don't perform tonight and fail to get the result. Think we've sold 16,000 tickets. You'd hope for a full house for a semi-final obviously. I don't think there's ever been a full RDS for a semi, has there? Well, maybe Ulster last time. Last edited by Dexter on May 19th, 2017, 1:50 pm, edited 1 time in total. Last edited by curates_egg on May 19th, 2017, 12:38 pm, edited 3 times in total. Look at the ticket prices. You are not going to get people in on a whim at those prices. Needs to be totally rethought for next season.